A sturdy bracelet with graduating ovals from centre outward. Adjustable length through T bar and three end rings. 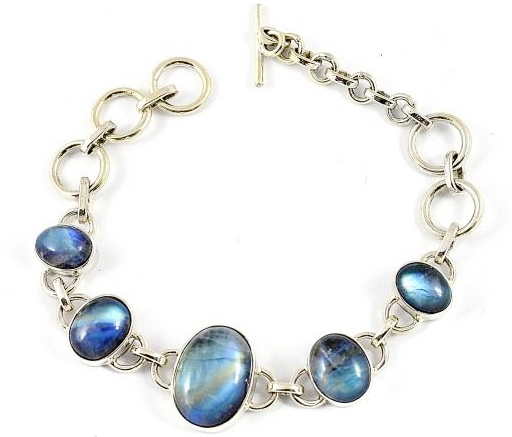 Rainbow Moonstone is individual and unique in each piece. We do our best to match the colours on the item picture but since all stones vary in shade and character there will be a slight difference in shade. Rainbow Moonstone all have inclusions so each stone has a different character. Delivery is FREE within the UK. All Items are despatched via Royal Mail special delivery (insured service) which is guaranteed next day delivery to your order dispatch date, which will be advised shortly after your order is placed. Please ensure you are available to sign for the item upon its delivery. All items come in a FREE gift box. All items returned should be in their original, new and boxed condition and within 14 days of purchase. Items must be returned using Royal Mail Special delivery (approx £5-6) or outside the UK using an Insured delivery method as any loss of item upon its return will not be refunded until the item is found or compensated for by the delivery method. Since the outgoing delivery is free to the customer, no charge is taken off the refund for its original delivery, but the cost of returning the item will not be refunded and it is the customers responsibility to ensure the item is returned using an insured delivery method. Any faulty item will be replaced or refunded upon its return after prior agreement with ourselves, any accidental damage to the item will not be covered for replacement or refund. Please contact us prior to any return for a returns code and return address details. a silver standard 925 mark.